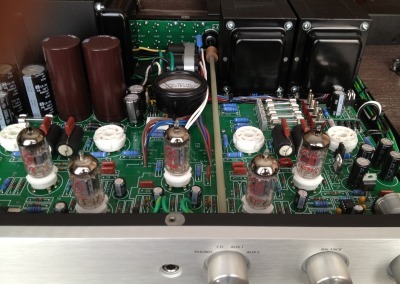 Looking for a fantastic sounding tube amplifier that has the guts needed to drive demanding speakers? The Rogue Audio Cronus is not only one of the better sounding tube amps out there, its also built like a tank and made in America. Fantastic attention to details and a built in phono section for MM cartridges will you have you jumping into Vinyl in no time. 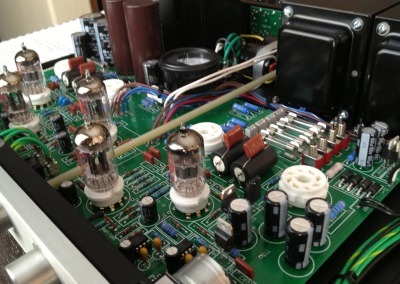 While selecting an amplifier, there are many factors that music lovers and audio nuts need to take into consideration. 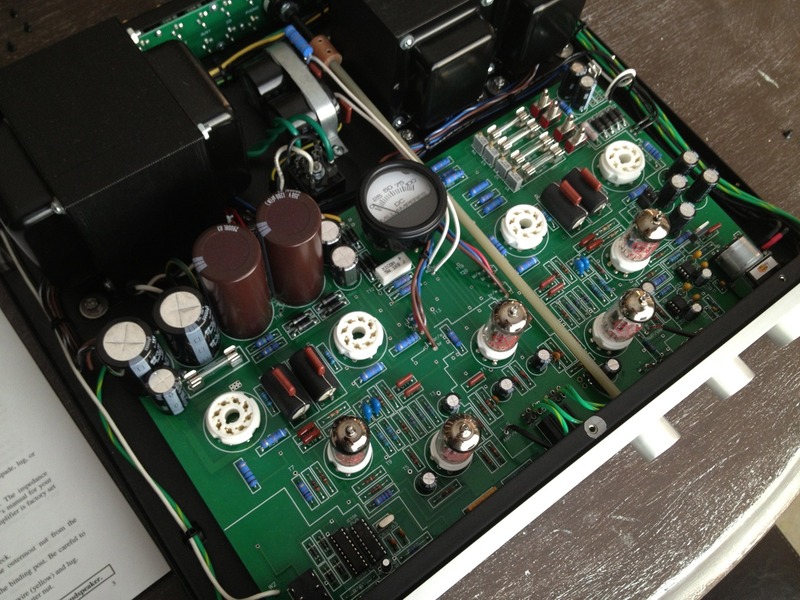 Initially, one should look at the speakers’ sensitivity and make sure the amplifier is going to be a good match. Meaning, the amplifier needs to provide the appropriate amount of power to the speaker for it to run it efficiently. With the Anthony Gallo 3.1, the sensitivity sits somewhere between 88-89 decibels. On paper it is not the most demanding speaker in the world but the 3.1 complicates things with its 10-inch woofer that desires to see a 4 ohm load. This configuration requires a bit more power on tap and most users pursue solid-state designs that double their power from 8 ohms to 4 ohms. Over the last year, I have owned the Peachtree Audio Pre/Power Amp combo, which fits the previously mentioned bill. It offers a staggering 250 watts at 8 ohms and doubles at 4 ohms reaching an astonishing ~500 watts/channel. 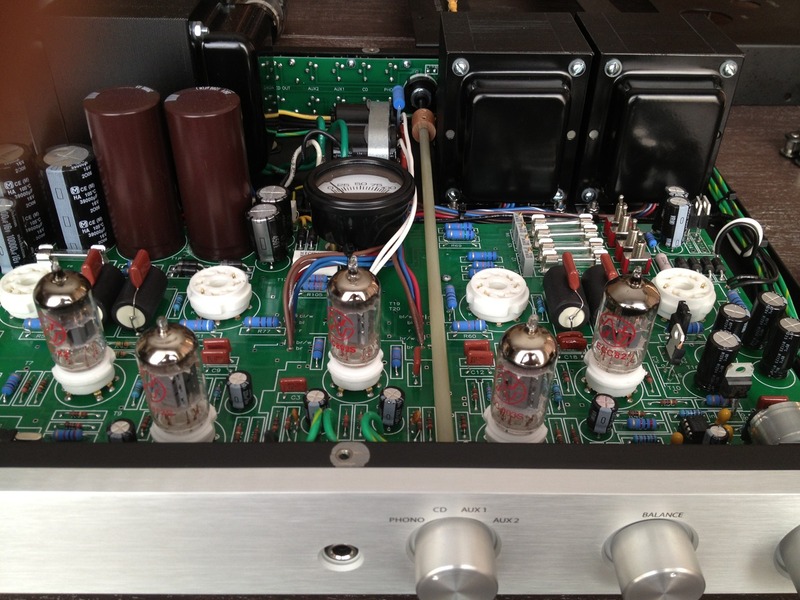 At a different time in my audio journey, I had owned an Onix SP3 tube amplifier that boasted 38 watts per channel. This amp was my first taste of tube amplification and hi-fidelity. It became apparent that this little tube amp was not up to task with grabbing the woofers with gusto when the Gallo 3.1‘s came into the picture. This is the reason I eventually sold the amp and upgraded for more power. I’ve always been curious about moving back into tube amplification and wondered what the Gallo’s could sound like with proper authority from a more capable tube amp. Also, my desire for getting into vinyl changed my needs in finding a higher quality phono-preamp and the Cronus gave this to me in an all in one package. The Cronus was shipped in a large cardboard box, measuring 25x22x10 and had me wondering if they pulled a “switcheroo” on me and loaded this thing with a ton of bricks! It weighs in at a whopping 55 pounds so make sure you eat your Wheaties before unpacking this monster. The amplifier is encased in dense foam inserts and had me convinced that the same amount of care in the amp’s design was also given to make sure the amplifier arrives in safety. Also included is a separate cardboard box with carefully packaged kt120 power tubes, the remote control and registration card. Batteries included… I love attention to detail. After renting a forklift from the local construction company and pulling the amp out of the box, I removed the thick plastic covering and sat the amp down for further inspection. From the front of the amplifier, the Cronus displays a brushed aluminum faceplate that can be ordered in black or silver (I opted for the silver finish). I also requested for the removal of the silkscreen “magnum” logo on the lower right of the amp as I was not a huge fan of the color choice and how it looked. Again, this is something that was customizable and I appreciated this level of support. The front panel layout consists of a volume knob that can be controlled by a remote. It also contains a power button, input selector and a balance control (these cannot be controlled by the remote). All controls feel solid to the touch and exude quality. Also included is a 1/4” inch headphone jack which disengages the speaker outputs for late night jamming while the wife is sleeping… nice touch. 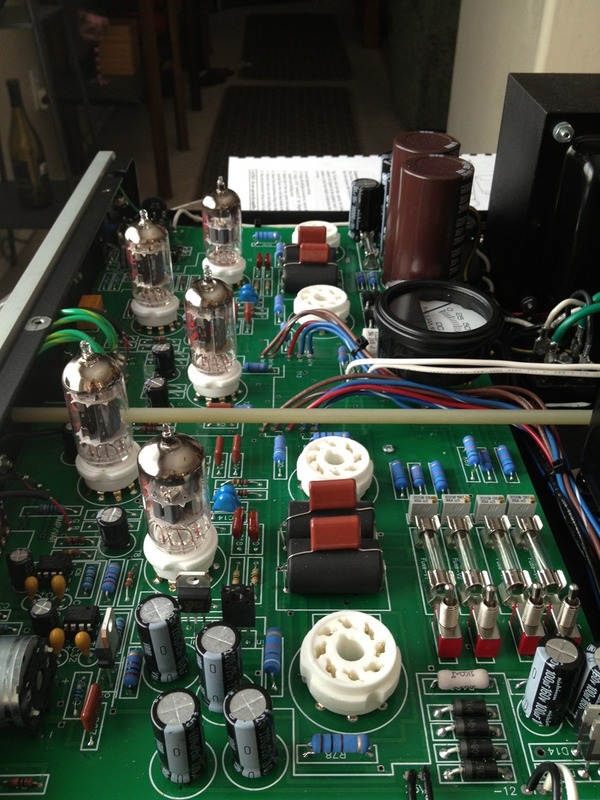 The amplifier came with the smaller 12ax7s and 12au7s installed so the only work needed was to install the larger power (kt120) tubes and bias the amplifier (more on that later). Looking from the rear panel, the amp features phono, cd, aux 1, aux 2 inputs via RCA connections. The amp also has a variable and fixed RCA out for connections to tape or dual sub-woofers if you so desire. The amplifier’s manual is easy to understand and well written, making the bias adjustments simple for anyone to understand even if they are intimidated by tubes and their maintenance. 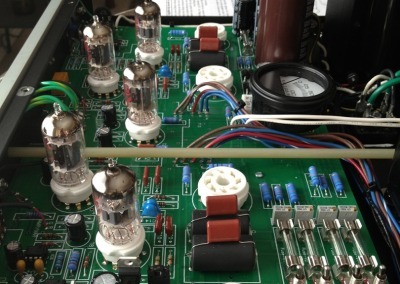 There is a small plate on the top of the amplifier that can be removed with 2 thumbscrews. Inside this compartment you see 4 small potentiometers and dip switches for each one. The dipswitches are labeled set/run and give bias control for each of the 4 output tubes. All you need to do is set the switch to “set” and use the provided bias tool (attached on the top of the amp) and rotate the potentiometer until the display reads ~35 ma. It’s important to note the amplifier volume should be set to 0 and the amp must be connected to the speakers for this process. The manual also suggests letting the amp “warm” up before a bias for 30 minutes. I understand this might be the longest 30 minutes of your life but believe me when I tell you, your patience will be rewarded. These adjustments should be done every month or so. The manual also mentions readings above ~5ma should be adjusted. After the bias, I quickly grabbed Vitalogy since it was fresh in my head from our recent review and dropped the needle in great anticipation. First thing out of the gate that grabbed my attention was how smooth the top end sounded. In comparison, my Pioneer’s tape-outs running into my Peachtree’s aux-in sounded pathetic. 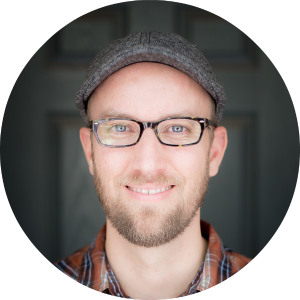 The “s” in vocals came across clear, detailed, and sounded natural without any audible distortion. I also realized that everything, and I mean EVERYTHING sounded bigger and wider that just seem to envelope every square inch of the soundstage. There was a warmth that I could hear that while reminiscent to the sound of the Peachtree, this was not contrived or trying… this amp was BORN to sound this way. As I made my way through the first few tracks of Vitalogy, I decided to move into something that would really challenge the amp’s prowess. Swapping the input to aux and firing up MOG from my wife’s iPad, I queued up Telarc’s 1812 overture and skipped straight to the cannon blasts. While holding my breath and preparing myself to be disappointed, the Cronus inhaled and effortlessly dished out deep bass with an impact that almost made me giggle. I now knew for certain the Cronus was here and was not messing around. Paired with the 3.1’s, the Magnum produced deep, rich bass that was both articulate and thunderous when needed. It would dishonest for me to ignore the differences between the Peachtree and the Rogue in this arena. I believe the Peachtree bests the Rogue in slam and transient attacks. I also believe the Peachtree digs down lower but we aren’t talking 50-80hz subwoofer areas of the music spectrum, we are talking about the bottom of the barrel, lowest octaves. The bottom line is, if these two amps were prizefighters, the 220 might pack the punch of Mike Tyson but the Rogue swings like Muhammad Ali. Which one would you want to get in the ring with? With my concerns of bass and power being washed away, I stopped worrying about specific material to test the amps abilities and just started playing music to enjoy what the amp had to offer. While I’m not a professional writer or reviewer, I found it easy to observe where the amps strengths were and playing Damian Rice’s “Volcano” it became abundantly clear to me that anything acoustic on this amp sounds so good, it’s difficult to imagine anything being able to top it. Specifically, the mid range spectrum of music is where this amplifier likes to really stretch is legs and show off what it does best. I noticed vocals on Glen Hansard’s and Markéta Irglová’s “Once” sounded better than I have ever heard in my listening sessions. The presence, tone and micro details in their voices showed off the glory of tube amplification at it’s best. While I cannot claim to be a tube expert, another thing I have noticed about this amp, is that it loves to be turned UP. I noticed this while listening to Eric Clapton’s “Signe” off his Unplugged album. I started with the volume hovering just above 10 o’clock but as I pressed the volume control on the remote, the music became more and more addicting. I have no idea what magic this is or why it happens, but I wont complain! While I am speaking about volume, I should note that if there is one smudge in this spotless review, it would have to be the remote control. The only two buttons on the remote are volume up and down and based on my usage, they are either too responsive or not responsive at all. There have been a few times where I am pointing at the amp and clicking but nothing seems to happen and others where the sensitivity of the dial’s motor is so sensitive that I moves from quiet to “holy cow that’s too loud” with no steps in between. I suppose nothing is perfect but for those that toss the remote and get off the couch, this will be a non-issue. The amplifier is well built, sounds incredible and offers the sonic flexibility of a Swiss army knife. 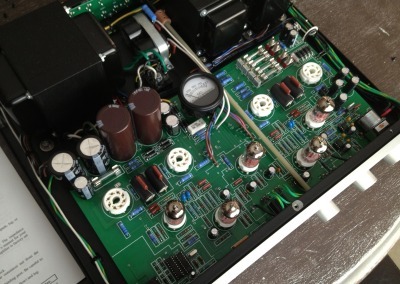 Having an integrated amplifier is a great way to step into hi-fidelity without breaking the bank or worrying about cables and other sources not cooperating with each other. The Cronus is an amplifier that is a statement piece, as it gets back to the basics in audio reproduction and gets everything right. Feed it with beautiful sounding music and it gives right back without any reservations. The amp stands it’s ground in bass reproduction and dishes out vocals, acoustics, and a sound stage that will surpass expectations and leave you wanting more. I am having a hard time coming up with anything I do not love about the Cronus. I suppose if I was going to nitpick, it would have to be the remote. According to Greek mythology, Cronus was eventually dethroned by Zeus and banished to Tartarus. Based on my time with this mighty Titan, I’d have to say the Greeks need to rewrite history, as I don’t see any rivals that will dethrone this king anytime soon.